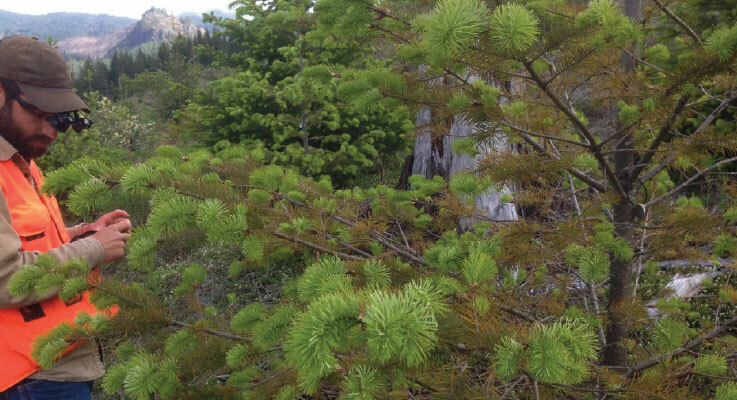 Two new foliage diseases of Douglas fir and several other conifer species are emerging in Oregon, and they could be a threat to conifer growers and nurseries. The pathogens include Phytophthora pluvialis, the cause of Pytophthora needle cast, and Rhizoctonia butinii, causing web blight of foliage on Douglas fir and several other conifers (Abies, Tsuga). Both P. pluvialis and R. butinii were observed in western Oregon forest settings during the winter of 2015, which was especially warm throughout the region. Although the connection to warm winters is only anecdotal, there may be something about warm winters that benefits these pathogens. Web blight has been well-known to Christmas tree plantation operators since the 1990s, but has recently been observed throughout western Oregon in native stands and forest plantations. At times, it can cause defoliation throughout the lower crowns of plantations after canopy closure. So far, it does not appear to be a significant negative factor in Douglas fir forestry. However, the disease is not specific to Douglas fir and impacts western hemlock in natural stands, and grand and noble fir in Christmas tree plantations. In particular, understory western hemlock in natural stands can be completely defoliated, with some mortality observed. Phytophthora pluvialis is common in western Oregon, potentially explaining lower crown needle loss in closed canopy situations of forest plantations and natural stands. However, the pathogen is also known in New Zealand where it is causing significant losses in radiata pine plantations. It appears that P. pluvialis was exported to New Zealand from the Pacific Northwest. During the winter of 2015, several locations where Phytophthora needle cast was observed were along forest edges. The entire side of an edge tree would be defoliated and the ground beneath was littered with green foliage. It is not possible to identify P. pluvialis in the field and molecular techniques are required to identify the Phytophthora. Traditional foliage diseases that we have known about for decades are Swiss needle cast, caused by Nothophaeocryptopus gaeumannii (formerly known by the scientific name Phaeocryptopus), and Rhabdocline needle cast, caused by several Rhabdocline species. Swiss needle cast is currently causing growth loss in Douglas fir plantations along the western slope of the Oregon Coast Range and coastal Washington, as well as some local sites along the western slope and lower elevations of the Cascade Range. The disease is being intensively studied by the Swiss Needle Cast Cooperative (http://sncc.forestry.oregonstate.edu/), a research cooperative based at Oregon State University. The disease is closely associated with climate conditions, specifically warm winter temperature and leaf wetness in May through August. Although Rhabdocline needle cast is also closely associated with spring leaf wetness, it is considered an indicator of off-site or non-local seed stock. Douglas fir moved from drier climates to moist climates, or high elevation to lower elevations, are often impacted by Rhabdocline needle cast. The importance of web blight and Phytophthora needle cast is not yet known and it does not appear that they are causing major damage in the forest. However, research and monitoring should continue and these two recently identified native diseases and should definitely be considered when defoliation is observed in Douglas fir. Figure 2. Signs and/or symptoms of (A) web blight, (B) Douglas fir needle cast, (C) Swiss needle cast, and (D) rhabdocline needle cast affecting Douglas fir needles. The signs and symptoms of all four foliage diseases of Douglas fir are summarized in Table 1, as well as Figures 1 and 2. Although both Rhizoctonia and Phytophthora species are known as soil-borne pathogens, in this case the diseases are strictly foliar. These two diseases develop in a similar manner in the field. They typically begin in the lower crown, moving upward. The unusual feature of web blight is that the needles stay attached to the tree after they turn grey or brown, unlike most foliar disease. A close inspection of these needles reveals a mat of threads, observed to be fungal mycelium, are attaching the dead needles to the tree. In Christmas tree plantations, disease development of web blight has been well characterized. The shearing of trees and the high branch density that develops are ideal conditions for this disease. Large circle-shaped areas of dead needles that remain attached to the tree are the characteristic symptom. Christmas tree plantations manage this disease by avoiding plantings near natural stands with web blight present, canopy drying techniques such as vegetation management and spacing of trees, as well as avoiding wet low-lying areas. Very distinctive blighted foliage that aggregates and holds together with visible webbing. Needle (green to mottled yellow) casting mostly in the lower crown in February to March, with piles of needles around base of tree. Cannot diagnose in the field with certainty. Major cause of growth loss in certain geographic locations particularly within ~15 miles of the coast. Foliage loss by distinct cohorts. Field diagnosis is only possible for several weeks in May (April to June) when characteristic productive structures occur. Foliage is cast by July. The symptom development of Phytophtora needle cast is less clear. It is assumed that the needles fall off the tree while they are still green. A close inspection of these needles does not reveal any obvious or consistent symptoms; however, banding and or mottling of infected needles has been noted (Figure 1). Severely affected trees will only have a few needles at the outer branch tips (Figure 2). For excellent summaries of all these diseases check out the The Pacific Northwest Plant Disease Management Handbook, which can be found online at https://pnwhandbooks.org/plantdisease, or the recently revised Compendium of Conifer Diseases (2018) by Everett Hansen, Kathy Lewis and Gary Chastagner, published by American Phytopathological Society (St. Paul, Minnesota).